Pasta is always a caravanners favourite as it's easy to store and great for cooking on a caravan stove! This recipe is particularly tasty and really easy to prepare and make. Heat the oil in a frying pan and then add the chopped onions. Cook on a moderate heat for 5 minutes then add the strips of bacon. After cooking for 5 minutes add the sliced mushrooms and then cook for a further 15 minutes. Whilst this is cooking, cook the pasta in boiling salted water. When the bacon, mushrooms and onions have turned brown, add the cream. If required, add salt and pepper to taste. Mix in with the cooked pasta and eat immediately. Serve with a crispy, green salad and vine tomatoes. You can add different ingredients to this pasta dish according to your taste, e.g. sweetcorn, spinach, cheese, ham. 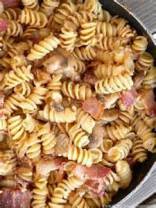 If you have made Bacon and Mushroom Pasta please let us know if it tasted good!! We'd love to receive a picture we could add to this page so everyone can see how tasty it looks!